We then decided to go to Rotorua. It is located in the lower part of Bay of Plenty, just about a 3-hour drive from Auckland and is New Zealand’s geothermal capital. In Rotorua, you literally stand on active volcanoes surrounded by boiling mud and geysers. I know it may sound dangerous, but I've done my research and the place is absolutely safe and child friendly. "Rotorua" comes from Māori word, "Roto" which means lake and "Rua" which means two or in this case "second" thus meaning “Second lake”. "Kahumatamomoe" was the uncle of the Māori chief "Ihenga", the ancestral explorer of the "Te Arawa". If you're interested in learning more about the rich history of the Māori, you can visit https://nzhistory.govt.nz/keyword/rotorua. Rotorua was the second major lake the chief discovered, and he dedicated it to his uncle. It is the largest of a multitude of lakes found to the northeast, all connected with the Rotorua Caldera and nearby Mount Tarawera. The name can also mean the equally appropriate 'Crater lake'. It was a fine sunny morning when we hit the road. This was Joed’s first long drive ever since we got his driver’s license, we had a good run. Since we were on a tight budget, we decided to visit places which had no entrance fees. Anyway, here in New Zealand there are a lot of tourist attractions to visit in which you don’t need to spend a single penny - except for fuel that is. We were heading to Kuirau Park, Rotorua Government Gardens and The Redwoods. Our first stop was Kuirau Park; it is easy to locate since it just right next to Rotorua CBD. When we got out of the car, the smell of rotten eggs were all over the place. It wasn't much of a bother though because the park was filled with beautiful gardens, a duck pond and a playground. We then follow the walkways through the park to see mud pools, boiling pools, and discovered the steaming, hissing and bubbling geothermal activities. It really opens up your pores. There are barriers separating visitors from the dangerous patches of the park. At the other end of the park, you can see a crater lake huffing steam, the atmosphere was warm. Upon seeing these geothermic wonders, it reminds me how Mother Earth is a living and breathing mechanism and powerful activities are happening underground. 5 minutes east of Kuirau Park, you could find the Government Garden Park & Rotorua Museum, a place of historical significance to the local Maori people because many battles were fought here. The garden is perfectly groomed with thousands of bright flowers and trees putting on a show in their radiant colours. Within the Government Gardens Park, you’ll find the Rotorua Museum. Unfortunately for us, the museum was closed for renovation. Nevertheless, we still admired the spectacular architecture of the museum. It’s essentially Tudor in style, with magnificent windows and a warm terracotta roof topped with a spire of the sort. We spent an hour relaxing at the park playground snapping photos here and there. You could see Zane really enjoying his time. Our last stop was a relaxing walk through The Redwoods Forest. There are a few trails on offer though we opted the shortest trail due to time constraint and lashed out a quick 1km trail under the diverse range of these silent giants. Zane was enjoying himself at first although half way through, I had to put him in the stroller for the rest of the hike because he got exhausted from our family adventure. It was a fascinating experience walking in the middle of the trees that were towering us, especially when it was our first time visiting a real forest. I should say that this was one of the best, most beautiful walking experiences I’ve had. After a long, tiring but fulfilling day, we had to call it in and hit the road again and it was time for us to head home. 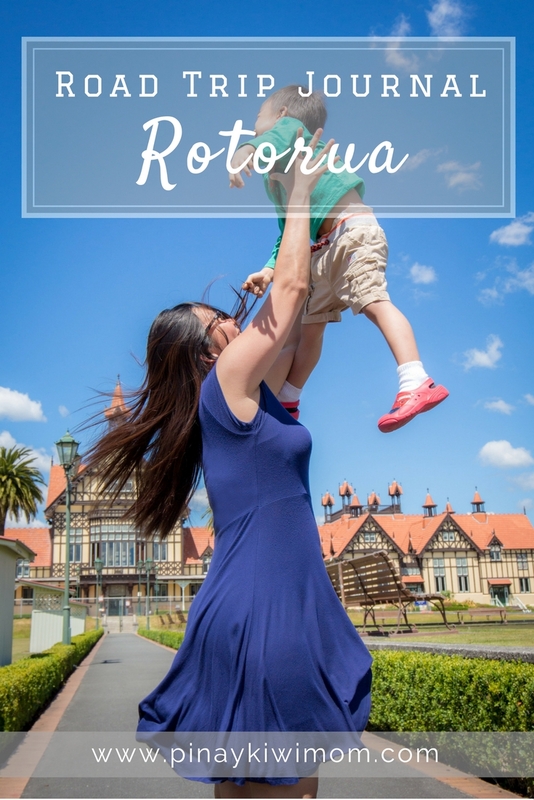 The places we’ve visited are just a few of other countless tourist attractions in Rotorua. We plan to return soon, and by next time, we will give it a few days and go visit attractions with a little more money in our pockets.